On 27th February Award participants of Sarala Birla Academy, Bangalore escorted by three school teachers and two professional trainers left the school after breakfast at 8:30 and headed towards Kudremukh near Chikmagalur, which was our trekking destination. We reached there at about 7:30 in the evening. Next morning assembled at 6:30 and after breakfast we left for our trekking spot. 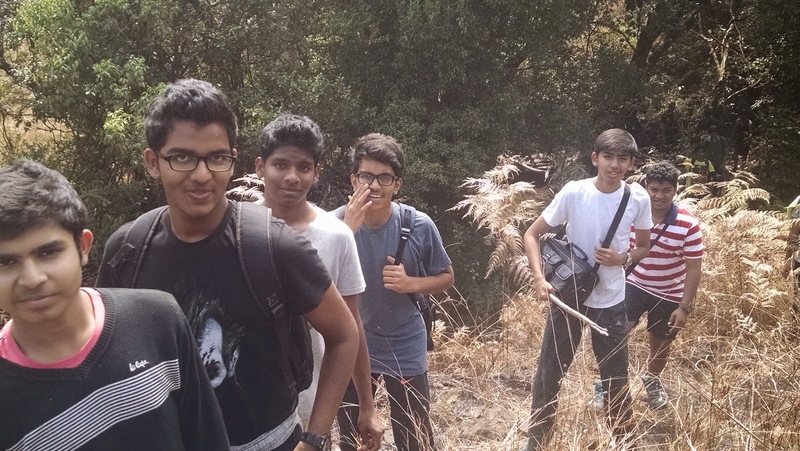 We trekked for 18km-20km up and down a hill. Although our trek was tiring, all of us manged to complete it successfully. We also clicked some elegant pictures on the way. We had a bonfire that we enjoyed, listening to songs and chatting with friends. We had a sumptuous dinner and went to bed by 10:00 as we were rather tired. At MBRS we indulge in various sports like football, volleyball, basketball, cricket, lawn-tennis, swimming, mini-golf, and other indoor games. Karate is an emerging physical activity along with yoga, to help us keep physically and mentally fit. I started playing basketball and soccer as part of my Physical Recreation for the IAYP. I learnt fast and soon was selected as a part of the school's basketball and soccer team. My team mates and I were always hard at work, practicing together to perfect ourselves at the sports. I participated in the North East Zone CBSE cluster tournament in 2014. We emerged as champions of the entire zone and got an opportunity to compete at the National level in Gujarat, representing the North East. Though we could not reach the finals, our hard work, perspiration, love and respect for the game rewarded us with the trophy for the "Most Disciplined Team" of the tournament. The ASIA Pacific Region Training For Trainers (T4T) for The Award programme was held between 8th and 10th March, 2015 at The Heritage Girls School, Udaipur. The training was led by Rob Oliphant, Regional Manager Asia Pacific Region. All arrangements in place, the 7th saw the arrival of the delegates. They came in from different parts of the country and continent (Delhi, Madhya Pradesh, Tamil Nadu, Maharashtra, Uttarakhand, Mahatashtra, Rajasthan, Malaysia, Sri Lanka) and lent a shade of vibrancy to the school atmosphere and the scenic beauty of the venue. The training itself was spread over three days and covered various aspects of training, especially with reference to the Award programme. Participants learnt to categorize the available data; design training content; understand that the audience is always a mix of different intelligences and learnt ways to cater to each one of them. Another very important lesson that escaped no one was one of Rob Oliphant's screaming flip chart reading, "PREPARATION PREPARATION PREPARATION". Fun and learning intertwined in the interactive training sessions. At the core of teaching was the individual presentations that the trainees made, where they presented various aspects of the Award in a simulated live classroom. The topics were assigned to pairs of participants on the first day of training, to be presented over the next two days. The entire block was abuzz with activity: people planning their presentations animatedly; some walking around the premises looking for props; some working on laptops; some colouring, cutting and pasting charts (some even had to forgo the yummy Rajasthani lunch!!). GSIS has taken up the initiative to sustainably serve (through the IAYP Residential Project of the Gold Award aspirants) the Kolikarai village under the aegis of the Nilgiris Adivasi Welfare Association. Fourteen of us (8 boys and 6 girls) from Grade 12 embarked on this mission from November 14 to 18, 2014 at Kolikarai, a tribal village of the Irula community in the Kotagiri taluk of the Nilgiris district. This tribal hamlet is located 28 km east of Ooty. We started by organizing and storing our provisions, kitchen utensils, tools, and bedding and once this was over, we were eager to get into action. It was a thrilling experience to cook our own food. Washing our own used plates and kitchen utensils, laundering our clothes were quite an eye opener that these mundane chores are possible and great to be engaged in. We learnt what it is to manage our living space for the next five days. Housed in the space provided at the village hospital and crèche, we helped clear off the weeds and trash from the nearby play ground which was also used as a volleyball court by the villagers. We were engaged in digging and setting up a compost pit for garbage disposal. Along with these, we had set up a fence around the play ground. In the following days, we presented an awareness skit on sanitation and healthy living. This was performed by students of the IGCSE Global Perspectives. We spent our evenings visiting homes and interacting with the village folk to understand their lifestyle. We found the people of Kolikarai very warm and supportive of our efforts to render service as well as to learn from them the true spirit of living. The NAWA ofce in Kolikarai encourages traditional herbal medicine. The herbal garden was a wealth of knowledge about the importance of varied herbs in providing immunity and important nutrients to our body. As a part of our project, we cleared the garden a8nd the pathways of all the weeds there. We then helped clean the Kolikarai village hospital. The Nilgiris Adivasi Welfare Association runs a primary school in the vicinity for the children of the Kolikarai village. We spent time with the children. We engaged in classes, distributed snacks. This project has truly made us experience another aspect of life. We learnt to survive with basic resources. The IAYP Residential Project challenged our outlook and expanded our horizons. It has inspired us to undertake our duties and responsibilities faithfully, excel in all that we do and to contribute valuably to society. There is no substitute to education as relief from unwanted pain and difficulties in life. A group comprising 31 visually challenged students of R.K.M. Blind Boys' Academy, Narendrapur, including IAYP awardees, took part in an Adventurous Journey held on 16th to 20th February 2015, at Susunia Hills in Bankura, West Bengal. The team left Kolkata by train on 16th February for Susunia and joined the camp inside the Koley Bungalow campus at the foot of the Susunia hills with other students from different organizations. A number of colourful tents were erected for the participants. The camp activities started after a brief inaugural ceremony under the guidance of camp commandant Amitava Datta (ICNL). The campers took part in different types of activities during the four days. The instructors of ICNL took theoretical and practical classes on Mountain ethics, Camp manners, Mountain Hazards and its solutions, Rock climbing, Rappelling, Chimney climbing, Shelter making, Survival, River crossing, Knot making and use of different mountain gear and equipment. The students attended the theoretical as well as practical classes with their indomitable curiosity. They joined in different interactions with the ICNL instructors and their sighted counterparts. Under the able guidance of ICNL instructors, the boys completed all the practical sessions successfully. They took part in a jungle trek to reach Shilalipi (a sermon of emperor Ashoka inscribed on a stone in the Pali language). The trek was very enjoyable for all. Mr. Bivujit Mukhoty, Prog. Manager IAYP took an enriching class on nature study and camping in the vicinity of Shilalipi. A gala camp-fire was organized on 19th February evening. The campers entertaned the audience with a cultural performance. The camp-fire ended with a grand feast. The team returned to Kolkata early morning on 21st February 2015. Being an Award Leader I have noticed that this Adventurous Journey incorporated so many Life Skills into our visually challenged Awardees. During these days participants enhanced their self-reliance, self-confidence, leadership skills, and working ability as part of a team. They gained the appropriate knowledge and skills to make an Adventurous Journey successful and improved their investigating, reviewing, planning and presentational skills. I convey my heartfelt thanks to IAYP -- INDIA and ICNL instructors for their path-finding efforts to empower our visually challenged participants for their future life.